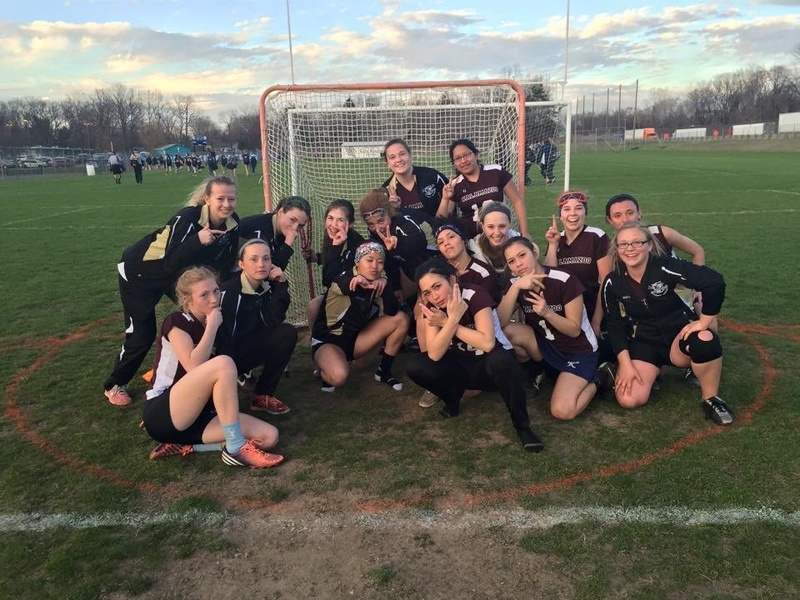 Kalamazoo Loy Norrix and Kalamazoo Central are cross-city rivals, but girls from both high schools come together each spring to form the Kalamazoo United Women’s Varsity Lacrosse Team. On Wednesday, April 15, 2015, the KU women came out on top with their first win of the season against Grand Haven. “It was an exciting game and great to have a win for our first home game of the season,” said Sarah Swafford team manager and mom to player Maggie Swafford. KU’s practice and game field, located between the softball and baseball fields behind Loy Norrix, was the ground beneath cleat prints and sweat and the home to the team’s victorious evening on Wednesday. “Winning felt amazing. Especially with it being our first home game of the season, I think we played so well and really earned it [the win],” said Loy Norrix sophomore Maggie Swafford. The KU Women have two goalies who alternate playing. Both were not not able to participate in the game Wednesday. Kalamazoo Central senior Katie DeHaan stepped up and got between the pipes to protect the KU net for the first time in her lacrosse career. “No one else was going to step up so I did because the team needed help. I was really anxious and nervous before the game, but I was ready for the challenge,” said DeHaan. As a captain and offensive player of the lacrosse team, DeHaan wanted to take leadership and experience playing a far different position than she was used to. “After the game I had to remember I only had one day to train and this was the first time ever doing it, so I was pretty happy with the game overall,” said DeHaan. The KU Women match up against Vicksburg and Tecumseh on Saturday, April 18, 2015 for the annual Super Saturday Tournament at Loy Norrix. 9am against Vicksburg and 11am against Tecumseh.